Demos that work on our compo hardware will be run live on the machines while other Atari platforms will need a video recording to be submitted as well. You can send us remote entries via e-mail (use a suitable subject so we don't miss it by mistake). Please tell us in your mail which machine and compo the production is aimed for. Don't forget to make a video available if the production is for a system we don't have at hand. In previous years, we've had one bitplane, twist and a big border competition. Here's the themed demo compo for 2019! We hope the compo will be easy to enter, but hard to win. 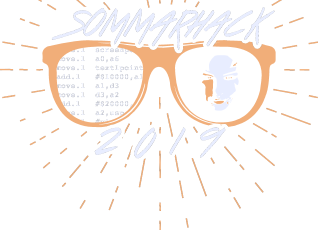 It's the first time we do a photo competition at Sommarhack. We hope that people who usually don't participate in demo, graphics or music will find a home here. The PI3 photo means that the image should load in Degas Elite with ST-HIGH resolution. That is a little bit of a limitation! Note: If you are unable to save your image in PI3 format, we also accept submissions in PNG or GIF formats (no JPEG!). The pictures will be saved as PI3 and will be shown in Degas Elite software during the competition. This is a combined competition and we will make sure that all hardware specifications as well as size of the demo is shown before it runs. You can enter any kind of Atari demo here, no limits! GIF, TARGA and JPEG images will be displayed on a Falcon with APEX viewer.